March 25th, 2011 is Diabetes Alert Day - an awareness campaign aimed at making people more aware of type 2 diabetes and encouraging them to take a few minutes to assess their own risk for the disease. Through this one-day call to action the ADA highlights the crisis in the United States and encourages people to find out if they are at risk for type 2 diabetes. Diabetes often goes undiagnosed because many of its symptoms seem so harmless: increased thirst, frequent urination, significant weight loss, blurred vision, itchy skin, and a numbness or tingling in feet. Risk factors include being overweight, being over the age of 45, a sedentary lifestyle and a family history of the disease. A seven question risk test for prediabetes or Type 2 is available online at the ADA website: http://www.diabetes.org/diabetes-basics/prevention/diabetes-risk-test/ . Once a diagnosis of diabetes is made, a myriad of lifestyle issues must be addressed in order to manage the disease, especially those related to diet, exercise and foot care. Xenna’s diabetic-friendly foot care products are distributed nationwide through chain drugstores, grocery and mass retailers. The company has an ongoing commitment to educating consumers about foot care issues and the benefits of natural products. Xenna’s NonyX® Nail Gel (pronounced "Non-X") and CalleX® Exfoliating Dry Heel Ointment are based on patented, natural formulations that focus on the exfoliation of keratin debris under toenails and dry, dead skin on the epidermis of dry feet. Both products are used by many podiatrists. NonyX Nail Gel was formulated to address the problem of yellow or discolored toenails – a common problem for diabetics as well as older individuals. 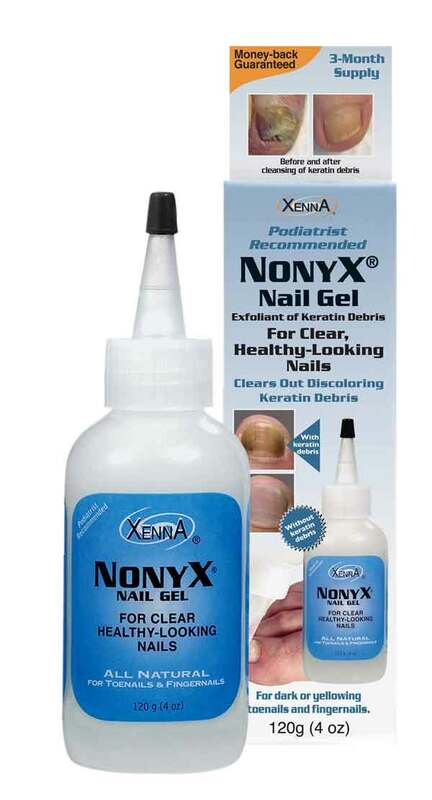 Rated a “top niche brand” in 2010 by Drug Store News, NonyX Gel works by breaking down and removing keratin debris – the unsightly white or yellow substance under toenails that makes them so unattractive. With regular use, twice daily application results in improved nail color and clarity within 5 to 9 months as keratin debris clears out. For dry, cracked feet, Xenna's acid-free CalleX Ointment offers a unique, fast-acting way to soft, smooth feet without the need to scrape or use a pumice stone – a procedure definitely not recommended for diabetics. CalleX Ointment’s unique, natural enzymes break down and exfoliate only the dry, dead top layer of flakes or scales that contribute to the look and feel of rough-to-the-touch, unsightly feet. The patented, exfoliating enzymes in CalleX are blended into a moisturizing base to keep feet hydrated. CalleX also has a refreshing peppermint scent (from natural peppermint oil) that keeps unwanted foot odor at bay. Both NonyX Gel and CalleX Ointment are natural, patented and free of potentially irritating urea, salicylic acid, parabens, lanolin, preservatives, artificial fragrance and colorants. Xenna Corporation has a commitment to the environment, as well as to the personal well-being of its customers. Manufactured in the USA, Xenna products are never tested on animals and they contain no animal byproducts. 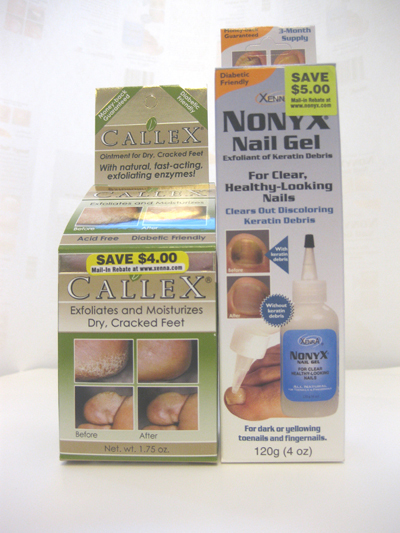 $5 and $4 rebate coupons for NonyX Nail Gel and CalleX Ointment are available at http://www.xenna.com/xenna_coupons.html. For special offers and product news, follow Xenna on Twitter at http://www.twitter.com/xennacorp . NonyX can be found in the footcare aisle at Walgreens, Walmart, CVS, Rite Aid (larger stores), Duane Reade, Kinney Drugs, HEB and Kerr Drug, Publix, many Medicine Shoppes, ShopKo, Harris Teeter, Sweetbay and online at http://www.drugstore.com and http://www.xenna.com . CalleX Ointment is available in the footcare aisle at Walgreens, Rite Aid, Kinney Drugs, Publix, many Medicine Shoppes, HEB, Kerr Drug, Stop & Shop and online at http://www.drugstore.com and http://www.xenna.com . Free shipping is currently available when ordering directly from Xenna. About Xenna: Xenna Corporation is a privately-held, woman-owned company based in Princeton, NJ which develops and distributes natural personal care products for skin, hair and nails. To contact them call 800-368-6003 (business hours, Mon-Friday Eastern Time). NonyX Nail GelNonyX is the diabetic-friendly, natural solution for clear, healthy-looking toenails. CalleX Natural Enzyme Ointment for Dry, Cracked FeetDiabetic-friendly CalleX uses natural enyzmes, leaving feet baby-soft and smooth. NonyX Nail Gel and CalleX Exfoliating Dry Heel Ointment$4 and $5 coupons available at http://www.xenna.com/xenna_coupons.html.